I didn't set any speed records, but stuck with it and made it through. I'm trying to push myself to ride more difficult roads...can't improve if I don't practice! I really like the retros', had a real problem when the Thruxton R came out. how do you like the cb1100? its a really great looking bike. I like the looks of these a lot. it would be great to have a new modern one with the reliability of one of the big manufacturers. I love it. It's a really fun bike to ride, and to look at. And, it is the only bike I have ever purchased twice. I had the 2013 version also (always regretted getting rid of it). Rode it to work after a 4 day unplanned break from riding. 30,000 kilometres - New brake pads front and back. Rear was about 3/4 or more done and front were about 1/2 done but had residue from fork oil leak during the summer. Going to change the brake fluid front and back when the weather changes to winter in the next few weeks. Started a new forum on this site: "Dropped in mud puddle air filter defeated should I get engine checked out? " Took delivery! (the cleanest it will ever be) and is now tucked up beside the Duc. Was woken up early today by hailstones banging off the bedroom windows but still went out for a spin in brilliant autum sunshine later in the day. Came home foundered after 40 miles. Bloody baltic, the heated grips are crap and that’s it for this year. A deep clean tomorrow and tuck it away for the next five months. I remember how I used to ride all through the winter, but these days, not a chance. 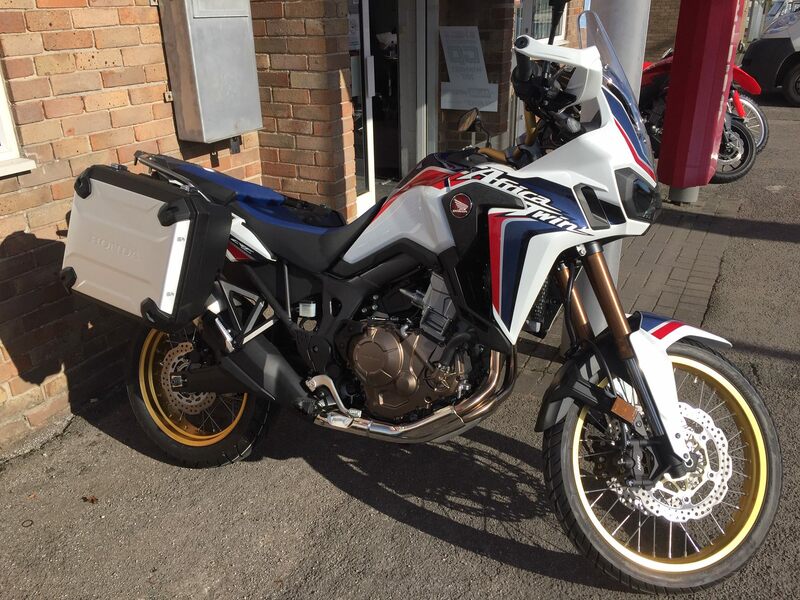 Installed a set of Denali 2.0 D2 Trioptic LED lights on the dedicated Africa twin bracket. Plenty bright enough, almost a perfect match alongside the main headlight. Not cheap but they are a quality, well made product that have an adjustable spread pattern with an set of E marked filters, so can be used on the road legally in conjunction with the headlight. Give it a go, You might enjoy yourself. Placed an emergency order for a set of rear brake pads. Thought I could make 16,000 miles but I was wrong. Will post a pic in the maintenance section when I get them replaced. 16K? I think I did mine at 8. I’m in the middle of repairing my latest crash damage. Radiator is straightened out, new inner shroud, air box cleaned out... going to install K&N’s, new chain and sprockets, hand guard mount and maybe cut the exhaust tips. Thinking about some Outback Mototek crash bars (mids and lowers). I put some K&N airfilters in and remounted the airfilter covers. will put the fairings back on tomorrow or the day after. still recovering from the last muddy baptism.